On the Hebrew na-nach.net there is an official thank you for 500 shekels ($148) that was put towards an amazing and much more accurate and credible new edition of conversations of Saba Israel (in the original Hebrew) which B"H will be sold for about 6 shekel a book (about 350 pages!). The book was formatted, edited, and everything else from beginning to end by our main manager of the Hebrew na-nach.net, a lot of work for the sake of Heaven. 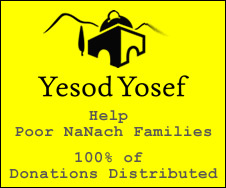 B"H we are aiming to print 2000 copies, and B"H you have helped to pay for about 100. In the opinion of many Nanach these conversations have been found to be the most effective tool in brainwashing people and indoctrination into Nanach as we know it. So this qualifies as top notch hafatza B"H.
Is this being published by the Keren?